In 1990 I was a shy, awkward teenager who was famously uncoordinated and spent most of my time with my nose in a book. I’m not even sure what inspired me to apply to become a ‘Junior Ranger’ - it must have been my love of the outdoors and a burning desire to get out of my small town! 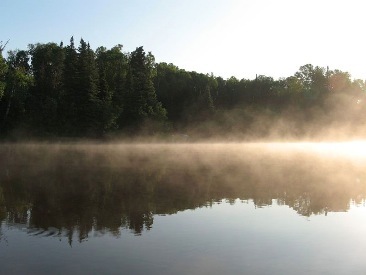 When I became a Ranger that summer at Sleeping Giant Provincial Park near Thunder Bay, it was the first time I had lived away from home, and it was by far the furthest I had ever travelled without my parents. 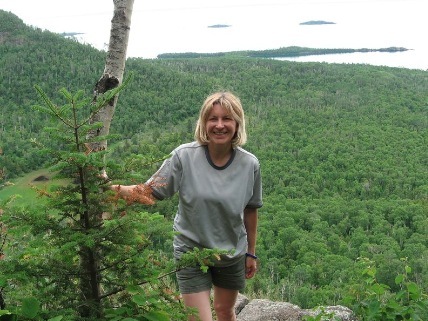 Although the Ontario Ranger program taught me how to wield a sandvik and plant a tree, the most valuable lessons I learned there were how to be myself, and that I could do anything I set my mind to. In conversations over the past few months with other former Rangers and supporters, I realize that I am one of many people who found great value in the Ranger program despite not going on to a career in natural resources. At seventeen, we are at a crucial stage in forming our identity and making the choices which will lay our path for the future. Many of us grow up in small towns, where it can be difficult to act independently of our family and our friends. Even in the cities, this can be an issue. The Ontario Ranger Program, which allowed young people like me to travel far from home to work with youth from across the province, was transformative in the confidence, independence and sense of possibility it gave to us at such a crucial time in our lives. After Rangers, I spent two summers working in provincial parks, and then moved on to university and other opportunities. My path has taken me all over the world and back again to the same small town where I grew up. Wherever I travelled and whoever I met, I was proud to identify myself as Canadian and to recount the tales of my “Ranger training”. I now understand just how fortunate we are to have our parks and wilderness spaces, which are the envy of people in many countries who did not have the opportunity or the foresight to protect their land and wildlife as we have. It is vital that we maintain and connect with the natural spaces that are an integral part of the Canadian identity. This is what I ask of the government: Please, listen to what thousands of people are saying, and reinstate the Ontario Ranger Program. The benefits of this program are probably much greater than the Ministry of Natural Resources realized. Although some of these benefits may have been inadvertent, that doesn’t make them any less valuable. You had a program that prepared young people to become brave, confident, capable adults, who would be an asset to our province and our country no matter what they chose to do. ​Don’t throw that away so lightly. In the summer of 2000, when I travelled the Ontario Northland Train from Washago to Cochrane, and the Wade Lake Ontario Ranger Camp beyond, I had made a decision that would change the course of my career. However, at the time, I had no idea that this was the case. My father and two uncles, each of whom had been a Ranger, told me how lucky I was to be spending my summer in the Ontario Ranger Program. Initially, I didn’t want to spend the summer way up north in the bugs, working long hours in the bush away from modern conveniences. But once I arrived, I found out very quickly that while there were indeed long hours working in the bugs, there was so much more than that. 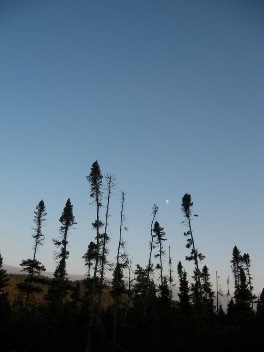 I became hooked on the remote wilderness, the summer flew by and I didn’t want to leave. At the completion of the summer, I came home with a number of certifications to put on my resume along with a newfound confidence and sense of accomplishment. The following summer I applied to return to the Ontario Ranger Program as an Assistant Sub-Supervisor and spent two summers at the Machesney Lake Ranger Camp. After my first summer at Machesney Lake, it was back to Grade 13 and time to choose a university program. Now back to that career-changing decision I mentioned. I had always been on a path of math and science. I still enjoyed math and science, but on its own, it no longer seemed fulfilling. It was missing something. In my case, it was missing nature, the environment, natural resources; all the things I had come to respect and care about during my previous two summers in the Ontario Ranger Program. I no longer wanted to design cars or work with electronics. What a relief when I discovered the Environmental Engineering Co-op Program at the University of Waterloo. Perfect! 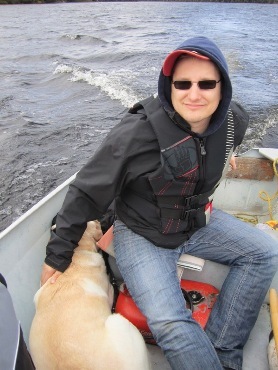 Once I completed my co-op requirements, I managed to squeeze in two more summers at the Round Lake Ontario Ranger Camp before graduating with a Bachelor of Applied Science in Environmental Engineering from the University of Waterloo in 2007. 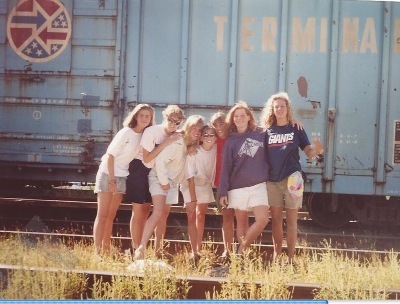 By stepping onto that train in the summer of 2000, I had changed the course of my professional career. 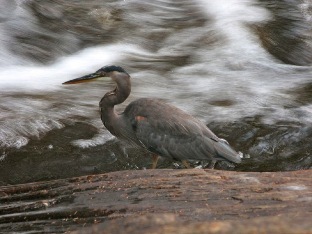 Without my Ontario Ranger experience I would not be a Water Resources Engineer today. It saddens me deeply to know that the benefits this program provides may be taken away from future generations. In my opinion, the Ontario Ranger Program needs to be brought back and expanded to afford future generations the opportunity, at the very least, to become aware of what the “environment” in Ontario really is. In some cases, it may change the direction of their career or even their life. What a shame to take that away. We should all aim for better. I am almost sixty years old now and thinking of Rangers has brought a smile to my face on many days since 1971. 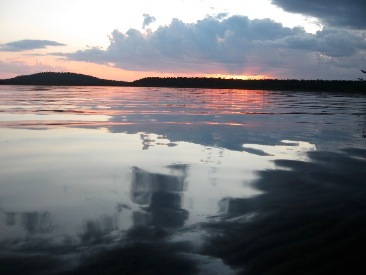 I grew up in the Toronto area and as such had not spent much time in the area north of Temagami. For a seventeen year old from the big city, learning to spot forest fires, fly in small planes, manage forests, do park maintenance and canoe were not a part of the everyday experience. 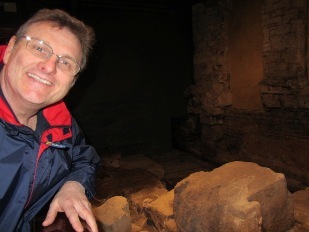 But these experiences have helped to shape and encourage many of the activities I have enjoyed throughout my life. My experience fighting fires on the rear lines taught me how quickly a dangerous situation can arise and I am careful with each and every campfire and have taught my children and students the same respect. I continue to enjoy flying in small planes and have even taken some flying lessons. I have hand built my own canoe. I can maintain my own buildings and property. I now own two acres of bush and maintain it regularly as my contribution to a lesser carbon footprint. Rangers encouraged me to continue my education in natural science and sociology, and I now have two university degrees and a trade licence. Perhaps the most valuable lesson I took away from Rangers was the importance of working together with others with an optimistic look to the future. 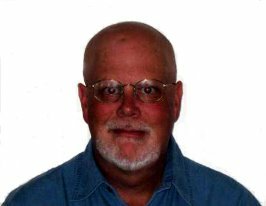 I taught high school mechanics shop for twenty-eight years, and part of that time as the technical director for the school. Each and every day was a chance to pass on the lessons of respect for others and nature that are so important in this changing world. I tried not to miss the opportunity of recommending the Ranger Program to all students as a great learning experience and a valuable part of their high school and lifelong education. Some of the experience and knowledge gained by me from Rangers, hopefully became the knowledge and experience of twenty- eight years of shop class students. I encouraged my own children to participate in the program and two of them have worked on staff at at least four Ranger Camps while attending university. It saddens me greatly that the Government of Ontario has cut such a valuable education and work program. 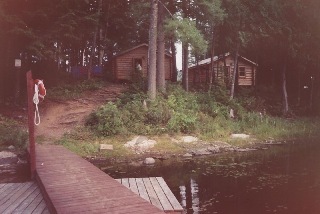 In 1976, my mother travelled ten hours north from her home in southern Ontario to Five Mile Lake Ranger Camp, outside of Chapleau, Ontario. She was the first of her seven siblings to go, but many more would follow. A family tradition was beginning. 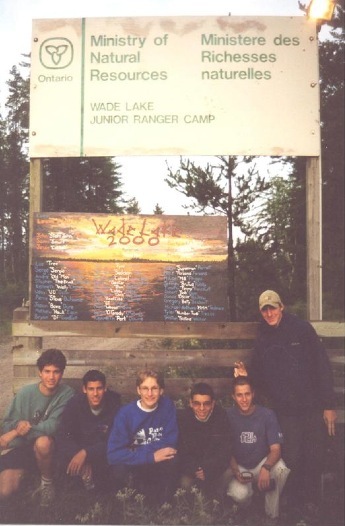 In 2006, my brother turned 17, and headed north to Wade Lake Ontario Ranger Camp. 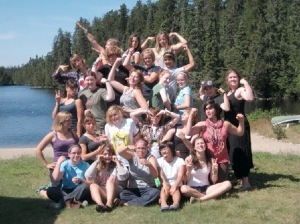 When my turn came in 2008, I too headed north to Dividing Lake Ranger Camp. Two years ago, I was very proud to see my little sister pack her bags and head north to Esker Lake Ranger Camp. I have another little sister, and next summer she would have applied to the program, to follow in our family’s footsteps. For our family, the Ranger program had become a tradition. For each of us, it was a summer of growth and independence unparalleled by any other two-month period in our lives. The experience weighed somehow on our decisions later in life. 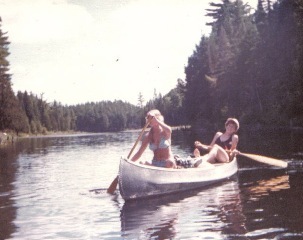 My mother’s decision to live in Northern Ontario was inspired by the summer she spent in the north. My brother and I decided to study environmental science, and my little sister and I returned to work as ranger staff. In just two months, the Ontario Ranger Program had profoundly affected the directions our lives would take. The Ranger program has become a tradition for many families, not just for ours. Year after year, youth arrive at Ranger camps across the province, telling stories of their parents, siblings or friends who had been through the program. And as each of the over 65 years of the program passed, the ranger family grew and grew. 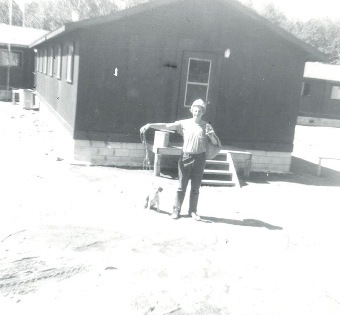 Despite closures of some camps over the years, links between families, camps and communities were solidified as another generation of rangers headed north or south from home. Since the announcement of the closure of the program, new members of this ranger family have come forward. 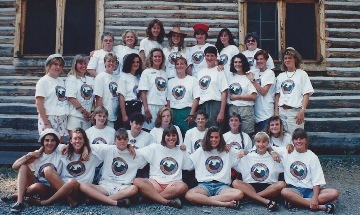 Photos from the early years of the program have been scanned and surfaced on the ranger blog. The photos posted on Friends of the Ontario Rangers facebook page span more than 60 years, and show the enormous network of the Ontario Ranger Program. Some photos are in black and white, some in colour, but the same message seems to predominate: “this was one of the most important summers of my life”. Being an Ontario Ranger is a summer experience which is passed on from generation to generation in this province. I am very grateful to have experienced my ranger summer, but I want the Ontario Ranger Program to be around for my children, too. 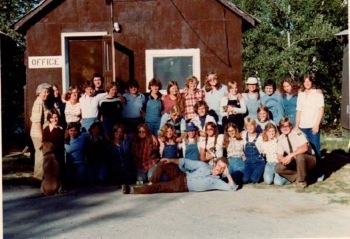 I was fortunate to have the experience of participating in the Junior Ranger program, as it was known back in 1977, at Ivanhoe Lake Provincial Park near Folyet. I was not a neophyte outdoors person, as many of my fellow campers were. 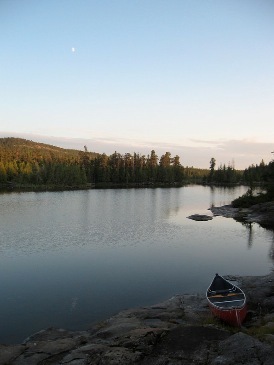 I had spent a few summers at Camp Kandalore near Minden, and at Youth Outdoors Unlimited on Lady Evelyn Lake in Temagami doing camp craft, canoe tripping, mountain climbing and rappelling. All of this previous experience was put to use as a Junior Ranger. The first work that we Rangers were put to was building a fence around our compound; the fence posts we made by cutting down trees, debranching them, debarking, and then cutting to size. We cut the grass of the baseball field with grass whips. We learned how to set up a fire line with pumps we primed with water, and then attached “football” rolls of fire hose to as we ran the line out through the forest. 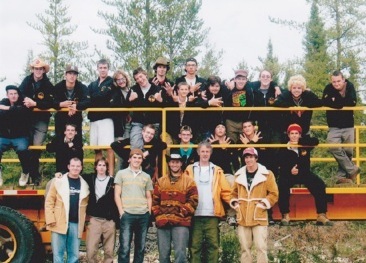 We did a number of Provincial Park maintenance duties like collecting the trash from the campsites, cleaning the fire pits of the campsites, hosing down the outdoor toilets, planting trees, fixing a guardrail on the corner of a camp road, and waterproofing the exterior of a newly built toilet base. We did rotations helping the camp cook prepare the meals for the day and cleaning up afterwards. We had a few visits from some of the other camps in the area, a canoe trip, and a jamboree of all the camps near the end where we had competitions like canoe jousting, fire line setup, orienteering, baseball, and tug of war. Later we had a demonstration from a water bomber that dropped water on a dummy in the centre of the baseball diamond, which it flattened. When it came for a second pass, people ran - but it had dropped the water from higher up and it came down like rain. I have had many jobs since then and have completed two diplomas and a B.Sc. 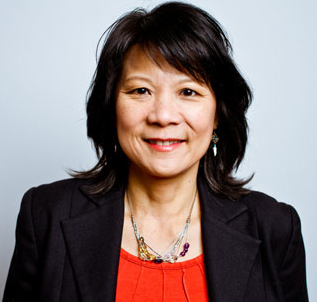 and now work in the Public Service at the Public Health Ontario (PHO) Public Health Laboratory –Toronto as a Senior Technologist. My son just managed to get accepted this final year into the Ontario Ranger Program in Cochrane at Wade Lake. He spent the first week in safety training, which I hope every kid gets when they start a job. 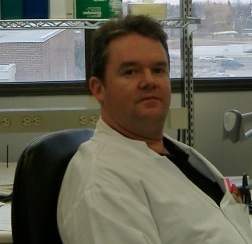 He participated in a number of community initiatives like the Gathering of the Cree. Hopefully the experience he gained as an Ontario Ranger will lead to further jobs and further education, as it did for me. 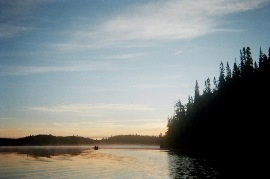 My first memory of morning mist on a lake was during the summer I spent as a Junior Ranger, far from home, in Obatanga Provincial Park. 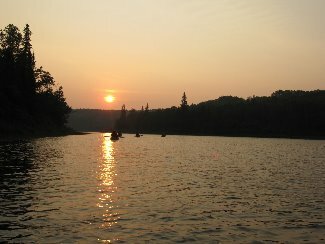 Always an early riser, I would wake up each morning and go out on the dock for some time alone before the morning breakfast bell and the scramble into work boots, work gloves and hard hats to begin another work day. I can’t remember the other verses but the tune was infectious. In the 35 summers since that experience, there has never been another one like it. Many will say Rangers was “a life-changing experience”. That should not be taken as a frivolous comment because for many of us, it was. The job application process did not discriminate. It didn’t matter where you were from in Ontario (unlike the current Ontario Stewardship program, which is only available to students living close by). You worked with 23 other 17-year-olds you had never met before (unlike the current program, which does not allow you to get away and redefine yourself). I was a shy, marks-focused, anxious, fear-controlled little girl when I arrived in camp. Every single day I was pushed to face my fears and succeed in the face of them. I was put in my place for having assumptions about others, and I was recognized for real accomplishments – not the same thing as being good at playing the game called school. We all learned the true boundaries of our capabilities as we succeeded at challenges we had never before faced. By August we were confident and strong team players, eager for the next chance to prove ourselves. We were intensely happy, supported, more courageous than we had ever been, and we learned to take pride in our abilities. Now, as a secondary school principal, I see kids every day that could benefit from a summer job as an Ontario Ranger, but they won’t get the opportunity unless we can show our provincial government what a ‘gem’ they had before axing the program last year. 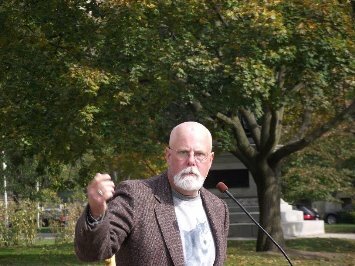 Reinstating Ontario Rangers is the only sensible option. This investment in Ontario youth has long term benefits for all of us, and with the current Ministry of Education focus on the achievement of First Nations, Metis and Inuit students, and students with mental health challenges, it makes perfect sense to make summer employment in this setting available to all Ontario youth, not just those privileged enough to live near the jobs. As a parent, I was thankful that my 17-year-old daughter was able to benefit from the Ontario Ranger Program a few years ago. It is unfair that kids born in 1996 have missed out on this opportunity. Let’s make sure that that next year’s grade 11’s have equitable access to the best summer jobs ever offered in Ontario. I was raised on a farm in the James Bay Frontier. At 17, I already knew what it was like to have physically challenging work, having spent countless hours in blistering heat in the fields during haying season, long hours in the gardens planting and harvesting, and weeks in the bush cutting down trees for firewood. Hardly anyone in my home community took part in the Ranger program, because their families couldn’t afford to replace them as labourers. My parents made a sacrifice by allowing me to go and I’ve always been grateful. 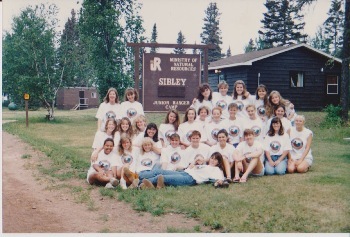 As a Ranger in l978 at Cashel Lake, near Bancroft, I worked and lived with an amazingly mature and kind group of girls who helped me to learn their ways, which made my transition that fall to community college in North Bay much easier than it would have been. I feel like my first summer in the Ontario Ranger program saved my life, because although physical tasks never daunted me, I was painfully shy and never would’ve been able to survive the outside world. While others Rangers that summer were popular, and were natural leaders because of their people skills, I struggled with socializing. But I found a way to shine because I was already fit due to farm work, and therefore I volunteered for anything that was especially physically challenging. I learned in that first summer that I could be proud of the knowledge that my parents and grandparents had passed down to me about weather patterns, animals and the environment and that not everyone my age understood the interconnectedness of nature to our existence. I came to understand that if my generation was someday going to be running the government, then those of us who understood such concepts should explain them to others so that they could make responsible decisions when they got older. As a Ranger and later as a staff member at Kap-Kig-I-Wan and Esker Lakes Ranger camps, I saw that young people from urban settings benefited from Rangers by learning the value of hard work, team work and the natural world. Young people from rural and remote communities benefited from the program for other reasons – like being exposed to people their age who had different behaviours, backgrounds, values and beliefs, in a safe environment where they could learn confidence in dealing with diversity. The program enabled them to make more informed decisions about their lifestyles, and their futures. 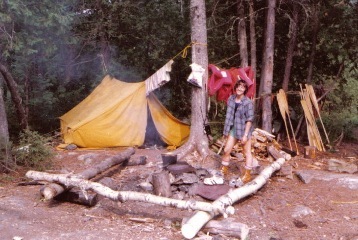 I vividly recall one out-camp we did in my first summer, near what is now Petroglyphs provincial park. We walked for about 45 minutes each morning and back again each night through the bush from the main access road, carrying our pick axes, sledgehammers, shovels, and crowbars, to break a large beaver dam in order to drain a swamp that had formed near the rock outcrop that has the petroglyphs. The dam seemed like the Great Wall of China because there was room for about 20 of us to walk quite comfortably on it. We had gradually built up our strength and teamwork on our canoe trips, and so this particular project at that time in the summer was a good fit for our crew. I remember that we were a non-stop beehive of organized activity, trust and teamwork. There were those responsible for cutting the logs with the crosscut saws, and those responsible for carrying them. Not much breath was left over for singing but we did manage some songs while working on the beaver dam, usually marching tunes and Tennessee Ernie Fords’ "16 Tons". That was 35 years ago. Here in Nova Scotia, I see so much potential, so much restlessness, and wasted energy in the young people in my community, but there are few programs for them and very little employment. Blogs posted by some former Rangers on this and other sites, predominantly by young men, indicate that they were experiencing a lack of discipline and direction in their lives and that they came into the Ranger program not entirely of their own volition - yet felt that they had really benefited from it. The Ontario government lacks foresight in removing the overnight Ranger Program. The cost of the loss to human resources and the leaders that aren't being created cannot be measured by conventional means.